Find the gun you want, pay us directly for the firearm. Choose your FFL dealer (Federal Firearms License): We cannot ship a gun directly to you, we do ship to the local FFL dealer of your choice. Any legitimate gun store or gun dealer has an FFL license; pawn shops and collectors may also have them. Pick up your gun: Inspect your gun before accepting the transfer. If you are not happy for any reason leave the gun at the dealer and contact us and we will arrange to have the gun shipped back to our facility. Guns CANNOT be returned after they have been transferred to you. Find a local licensed FFL dealer in your area. 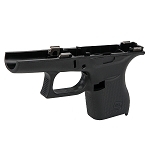 Contact the dealer and let them know you would like to receive a firearm for transfer from RifleSupply.com. Be sure to ask about their FFL transfer fees prior to shipment. Provide your dealer with our mailing address or email ( FFL@Riflesupply.com) so they can send us a copy of their FFL license. Once you have selected an FFL for your transfer, please indicate the dealers name (name on the FFL) on your order so we know where to ship your firearm. We cannot ship the firearm until we have a copy of their FFL license. Please type the dealers name and contact information if available in the COMMENTS section of your order. Once you accept the transfer, the gun is considered used and must be returned directly to the manufacturer for warranty repair or replacement. Any returns to Rifle Supply AFTER accepting the transfer from your dealer WILL be charged a restocking fee of 15%.